Congratulations to the winners of PR Daily’s 2015 Visual & Infographics Awards! This was the first year for the Visual & Infographics Awards. Boy, did we see the best of the best! Entries came flooding in, demonstrating the high creative thinking and expertise we were looking for. The entries showed extraordinary imagination and intelligence in design and infographics. Our judges have carefully reviewed the entries. They have chosen the best and we are ready to announce the winners of PR Daily’s Visual & Infographics Awards. 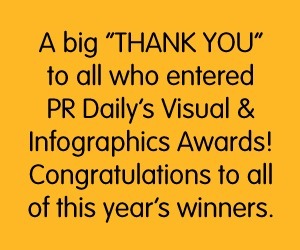 Please join us in congratulating the winners of PR Daily’s Visual & Infographics Awards!